The purpose of the Georgia United Methodist Foundation's Scholarship Endowment Program is to provide matching United Methodist Dollars for Scholars scholarship support for Georgia United Methodist students attending United Methodist higher education institutions. 1. Donate $15,000 and receive a challenge match of $5,000. Three challenge matches are available through 2025. 2. Name a scholarship in honor or memory of a person, group of individuals, or an organization. 3. Designate any participating United Methodist-related school. 4. Designate students from a specific United Methodist Church. 5. Your pledge may be made over three to five years. 6. You may also donate any amount to GUMF's Scholarship Endowment. Contact Nancy Young, GUMF Director of Planned Giving and Scholarships, at 678-708-6601 or nyoung@gumf.org. "We are here to empower our Methodist students to change lives. Join us!" Nancy brings over 35 years of nonprofit experience in the areas of fundraising, major donor development, training, special events, planned giving and facilities management. Prior to joining GUMF, Nancy served as Vice President of Development for Action Ministries. 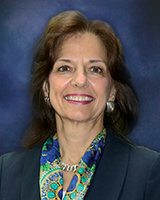 She began her career in development while serving as the Executive Director of the YWCA of New Britain, Connecticut.